Newcomer of the Year Hidadlgo's Gus Sanchez poses at Edinburg Vela High School on Thursday, March 22, 2018, in Edinburg. EDINBURG —Hidalgo’s season hung in the balance during the team’s first district game, against Rio Hondo on Dec. 19. Junior shooting guard Andy Flores suffered a season-ending knee injury, meaning the Pirates had lost a 20-points-per-game starter for the remainder of the district year. Sophomore Gus Sanchez made his first start the next game, and Hidalgo never missed a beat. The Pirates (25-11, 13-1) played near perfect for the entire district season and earned a district title. Hidalgo’s season came to a close in the bi-district round against Rockport-Fulton with a heartbreaking 44-41 loss. Sanchez scored 13 points with 5.1 assists and 3.9 steals per game on the way to earning the District 32-4A MVP award. 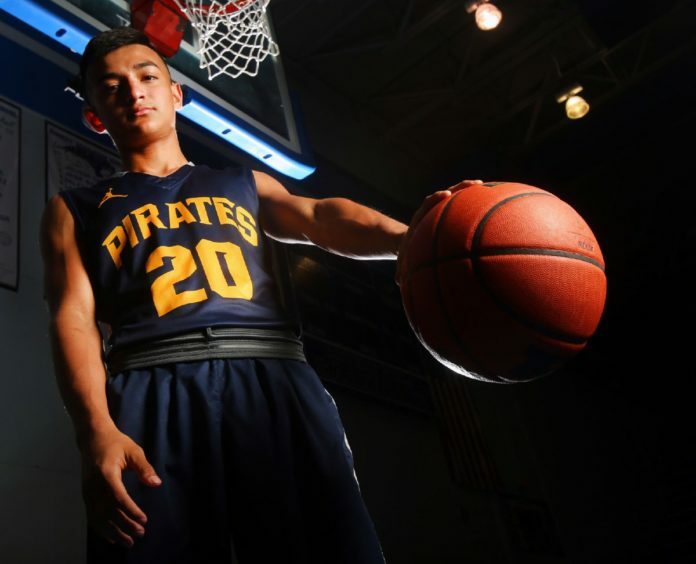 For his play on the court and his effort to keep Hidalgo on track despite a devastating injury, Gus Sanchez is The Monitor’s 2018 All-Area Newcomer of the Year. Gus, short for Gustavo, is coached by his father, who also goes by Gus although his birth name is Guadalupe. The elder Sanchez said the decision on when to start his son was tough. Most of Gus’ relatives have worn the No. 20 jersey, including his father, his aunt, and his cousins Frankie Sanchez and Savannah Sanchez. This season was Gus’ first year wearing 20. Gus stands just 5-foot-7, but he uses his size to his advantage. He slips between defenders in the lane, and he is a magician when it comes to taking the ball from his opponents. Gus said his love for defense developed from the chip on his shoulder as a result of being one of the smaller players on the court. Senior point guard Aaron Anaya helped Gus along this year. Gus knows he will be playing point guard next year, so he soaked up Anaya’s advice like a sponge. Sanchez said he can’t wait for next year.